The findings of this research point to the development of and the constant need to refine the operational buildings of the Manchester Police. These have been little studied. It is not the case that stations remain operationally and tactically viable for generations. In fact this is the exception. Police buildings especially those used for the detention of prisoners required regular maintenance and ultimately upgrading or replacement. The Manchester Watch Committee minutes provide considerable evidence on expenditure on buildings, on sanitation, heating, repairs, extensions and refits, prior the request for new stations. [see Police Station pages]. In some districts such as Ancoats the new station was within a close distance of the old one such as Kirby Street PS, one of the inherited pre-1839 stations. This was replaced by Cannel Street PS in 1887 after 50 years on an adjoining street. Conversely the Ancoats district Oldham Road PS moved eastwards from the city with the ever rising population to Livesey St in 1852, before the Goulden Street and Willert Street stations were built in the late 1870s to meet exposed operational deficiencies. Figure 2 OS Map clip, Cannel St PS middle right as a square red box opposite Kirby St the site of the previous station. Ancoats never lost its status as a deprived and difficult working-class district and as such retained the lion's share of police resources and police stations in the city. There was a clear trend for these stations to increase their size and capacity as not only the establishment of the force increased (from approximately 300 to 1000 officers within the period) but the number of prisoners and processes the police dealt with also increased. One such criterion was the housing of the officers within the station. Whereas under the old pre 1839 policing regime officers would rent locally and walk to work, a clear operational advantage was seized in the mid-century, by providing barrack room accommodation within the station. This ensured the rapid deployment and security of the constables, along with an improved 'esprit de corps'. Conversely, Miller (1977) argues that the police station accommodation designed primarily for the residence of the young bachelor recruits, enabled the Chief Constables to exert a high degree of discipline and control with which they moulded the new constables into ‘agents of impersonal authority - free from local or class ties’. The use of barrack room accommodation also avoided conflicts in the often hostile working class districts with their varied corrupting influences, such as cohabiting with females. However, experienced officers, once permitted to marry a suitable partner and rent a home, would struggle on low pay to afford their rents in other than the poorest districts, the same ones they would be expected to police. One further concern was that a sub-culture could be created within these closed police station communities, alienating the constables from the people they policed. However the possible formation of such attitudes was countered by their supervisors with strict discipline and the close monitoring of the constable’s behaviour, to ensure their interactions with the public were polite, even-handed and free from unnecessary force or assaults. For example, in 1874 the newly recruited PC Oversby of the Lancashire Constabulary, recalled not only the discipline, harsh conditions and his frequent use of force, but also having to ask permission of the Station Inspector to leave the cramp Rusholme Police station when off duty. [See Police Personnel / A Policeman’s Lot 1870]. [see Police Personnel -A Policeman's Lot]. As the numbers of officers increased so did the size of the police estate. However, the design of these buildings did not mirror the architectural grandeur of a city, in which as Kidd (2006) describes which 'warehouses were built as palaces'. 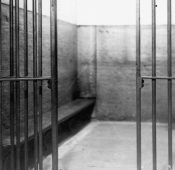 Instead police stations were designed with a high level security from possible rioters, with steel shutters and doors, extensive iron window bars and high windowless walls. Such measures made stations safe from the threat for example of Fenian attack from the 1860s. ‘ a forceful even monumental design... a high windowless façade [it] has a giant arcade topped by a pediment all in stone. The rest is brick...in workmanlike Gothic, but somewhat more akin to a stronghold was required in this notoriously lawless area’. One indication of the scale of this investment in police buildings in the North-West was the significant amount Manchester as a borough force and the Lancashire Constabulary spent on ‘stations and lock-up houses’ between 1852 and 1879, compared to all the other borough forces and counties of England and Wales, including the City of London and Metropolitan Police District. The 1881 House of Commons’ return for 1852-1879 reveals Manchester invested more than any of the other 166 borough forces, some 15 per cent of total borough expenditure, and Lancashire County more than any of the other 41 counties some 19.2 per cent of total county expenditure. From the late 1840s Manchester’s commercial classes and new ‘urban aristocracy’ began building the finest warehouses, commercial and public buildings. They displayed a previously unseen gentrification through these commercial buildings, their palaces of commerce symbolised the new industrial society and their patron’s wealth and taste. By the 1850s the cotton industry had made Manchester extremely prosperous and it was regarded as an important provincial capital. In 1858 arguably Manchester’s finest warehouse, the S & J Watts warehouse on Portland Street was opened. Commissioned in 1855 by the brothers Samuel and James Watts, it was designed by Henry Travis and William Magnall. It was the largest and most ornate warehouse in Manchester costing £909,000. It still stands as a testament of how a functional, successful commercial building can be a symbol of civic pride and architectural flamboyance. But what of those city centre public buildings which housed the legal operations of the society. Three of Manchester’s finest deserve comparison with the operational police buildings of these two decades. Firstly, the Manchester Assize Court built on the site of the old Strangeways Hall. Considered the first of Manchester Corporation’s great public buildings, it was designed in the emerging Gothic style by the young Alfred Waterhouse (1830-1905). The design was judged by Ruskin to be, ‘A very beautiful and noble building’. The Courts opened in 1864. 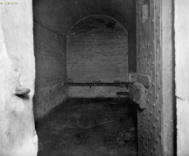 They were followed by Waterhouse’s Strangeways Gaol completed in 1869, at a total cost of £290,000. The New Police and Sessions Courts on Minshull Street were completed by 1873. Commissioned in 1867, they were designed by Thomas Worthington and completed at a comparatively prudent £81,000. Pass (1988) has praised the ‘flexibility of the Gothic style’ in his description of this ‘masterly demonstration’ of ‘dramatic urban composition’. By contrast the design of the city’s police stations displayed none of this public display and exuberance. Police buildings were austere, and bastion-like in their presence. They displayed civic authority by the inclusion of the City’s coat of arms and their blue lanterns, the grandest example being Goulden Street, where these took on huge proportions. If civic pride was important here, it was as a fortress or citadel, not delicacy or modernity of design. One determining factor was the budget available for such stations. The station records indicate a minimal spend on each building being required, and as Table 2 indicates a total of £73,187 was spent on building all police stations from 1852-1879. This was a significant total expenditure on police buildings compared to other borough and county forces but still less than the Minshull Street Police Court building. It was not until the 1900s before police stations were designed along the lines of traditional civic buildings as Newton Street PS (below) - but even this open redesign is not all it would seem as protective security remained paramount. The finest example of the new Edwardian stations was the showcase building of the London Road Fire and Police Station. For an unconventional and controversial view of its interior specifically the cell and police station parts the following site suggests its former glory. Manchester Watch Committee Minutes, 1839 – 1903 Vol. 1-31 (Manchester County Records Office. M/9/30/1-31). J. Roberts, ‘”A densely populated and unlovely tract”, The residential development of Ancoats’. Manchester Region History Review, 18 (2007) pp.15-25. Wilbur. R. Miller, Cops and Bobbies: Police Authority in New York and London, 1830 – 1870, (London: University of Chicago Press, 1977) pp.25-36. David. Taylor, The new police in nineteenth-century England, (Manchester: Manchester University Press, 1997) Ch.3. and C. Emsley, The English Police: A Political and Social History, (Harlow: Pearson, 1996)(2nd.ed.) Ch.9. Alan. Kidd, Manchester, a history, (Lancaster: Carnegie Publishing, 2006)(2nd.ed.) p. 104. 27 May 1843. WCM 17 Oct 1867. 'Iron bars to all windows and fan lights, revolving steel shutters, steel plates to doors and gates, four or five foot height extensions to outer walls'. Clare. Hartwell, Manchester ,(London: Penguin, 2001) pp.288-9. Police Expenditure. Return to an address of the Honourable House of Commons dated 14 March 1881. House of Commons Parliamentary Papers Online. http://parlipapers.chadwyck.co.uk. 1 Feb 2013. A. Briggs, Victorian Cities, (London: Penguin, 1968) p.94. J. J. Parkinson-Bailey, Manchester: An architectural history, (Manchester: MUP, 2000) p.74. A.J. Pass, Thomas Worthington: Victorian Architecture and Social Purpose. (Manchester Literary and Philosophical Publications Ltd, 1988) p.62. Parkinson-Bailey, Manchester, p.99 & pp.116-7. C. Hartwell, Manchester,pp.74-6. Opening initial cost £775,882 minus £40,708 for sale of materials and financial refunds, but this did not include the later fitting out of the interior. T. Wyke, ‘The Albert Memorial and the making of Civic Manchester’, in C. Hartwell, & T. Wyke, (eds.) Making Manchester: Aspects of the history of architecture in the city and region since 1800, (Lancashire and Cheshire Antiquarian Society, 2007) p.107. See each station page for the extracts of the relevant W.C.M. Land prices have not been included for comparison as these were often complicated with lease and rental clauses before outright purchases.